First pic, Black Elderberries, sambucus canadiansis, ripening on the branch last fall. Second pic, a splash of elderberry wine handmade made from those berries, aged almost a year. Smooth, dry, and fragrant, and rich with powerful immunity boosting compounds. love it! this one looks very decadent and healthful. 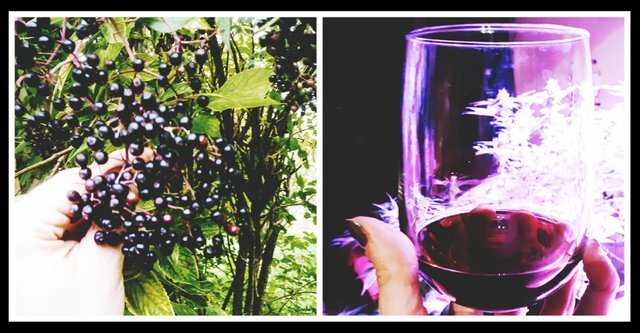 go elderberries and aged wine! :O Ĉu vi parolas esperanton? Elderberry. I have seen that name. It sounds like something out of Skyrim. Elder Scrolls and Elder Berries, all ready for making potions! We are also holding a challenge at the moment for a chance to win Steem. You can read the original post here and entries are due by October 17th. Cool I'm still new here so didn't know something like this existed :) I will check out ur introductory post and hopefully chat with everyone on discord soon! Woo! Love your post - we've given you a wee upvote with a chance to be featured in the weekly curation. We encourage you to use the #naturalmedicine tag so we can more easily find you.